Regular guest lectures are arranged to know what is after PUC. 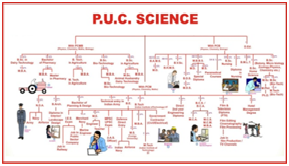 Science students exposed to various courses available like Engineering, Medicine, Paramedical Courses, Clinical courses, Forensic science, Agricultural science, Pure Sciences etc. Commerce students encouraged to take up courses like CPT, Law, Foundation for CA/ICWAI, ACS, BBM, BCA etc. The Soundarya Educational Trust reminds me of the Gurukal of yester years where emphasis were given not only on education but on living a life of self respect, dignity and thus has transformed my ward into a refined fabric of society. Proactive participation of parents in shaping our students future. To get first hand update on their ward’s progress. College authorities will be sending periodical updates on students attendance, performance in term examinations etc., to the parents. Parents are requested to stay in regular touch with their son/daughter, studying at Indian Academy institutes, and take necessary initiatives and offer proper guidance and help them to do well in their academic endeavors.